Absolute is a 64-bit Linux distribution based upon Slackware. It concentrates on "desktop" use so that it is ready for internet, multimedia, document and general home use out of the box. Absolute is lightweight -- meaning 2 things: that it can run on on modest hardware and that the OS interface stays out of your way... but includes the latest software like: Kodi, Inkscape, GIMP, LibreOffice, Google Earth, Google-Chrome, Calibre, etc. It is version-compatible with Slackware so you can use almost any package from the same version of Slack on Absolute. Development libraries (headers) for everything installed are always included, so you can code and/or build almost anything from source. It is what I use all day, every day, and I am very thankful for Linux and Slackware and I hope others find benefit from my work on Absolute. Another snapshot release. Biggest difference is to change updating via gslapt to the directory of a monthly snapshot, rather than rolling with very single update to the system that resides in "current." Current is still there, and you can even switch settings in /etc/slapt-get/slapt-getrc to point to it, rather than the snapshot. Switched to "snapshot", which seems more appropriate for interem releases on -current. SO MANY changes since last beta, the snapshot was really needed. Another new kernel, fixes for mime usage as well as permissions/polycykit tweaks. This is of a state to be considered a release candidate. Test, test, test. Releasing as beta, giving the opportunity to get extra testing and feedback prior to final. Also to help mitigate the current meltdown and spectre security problems, of which the current Slack kernel (4.14.14) still takes care of 2 out of 3 vulnerabilities. See image of test results or download the test script. 2 kernel updates since first beta, plus all updates from Slackware up to the 18th, some library updates, a few fixes, some file handling tweaks in ROX and ICEWM as well as "restricted" updates to ffmpeg, mplayer and openshot. Releasing as beta, giving the opportunity to get extra testing and feedback prior to final. Comes in a 32 as well as a 64-bit version. Same basic functionality, but most everything updated under the hood. No longer fits on a single CD -- the usual installation method is a USB stick. With this size-constraint removed, larger apps like LibreOffice and Calibre are now included in the base installation. Both installers have an "Autoinstall" option, which partition and format your drive. The 64-bit version will make GPT partitions if you are booting EFI. But just as with Slackware, you need to turn off Secure Boot in the bios if it is set. basically a whole lot of goodies. But without the load of overhead found in many other systems. Many of the same apps and features, but recompiled nearly everything due to newer libraries (especially PNG lib.) Python3 and GTK3 transitions have begun, I suppose, as both are now available. Extra support packages will be needed by apps that do use them. New kernel as well as a slew of updates and fixes. Jumping back into the distro after a long absence left a lot of loose ends... I had to make quite a bit of tweaking to get everything to just work. Hope it helps you get things done! Base install still fits easily onto a CD. If you want to burn a DVD or, more likely, plop the iso onto a usb stick -- there is also a "large" version of the ISO, which includes LibreOffice, the kernel source, calibre, Inkscape, Skype, Artha dictionary/thesaurus and several developer tools. This is a "final" release for the 14.0x series. So even if you do not install from DVD or USB, you can download the LARGE iso and have many of the compatible extra packages at your future disposal. I know this was too quick for a new release, but having the power management features work out of the box is kind of a big deal. New kernel, a number of application tweaks and quite a few packages updated for security fixes. Also made better use of a battery monitor for laptop use, automatically triggers a system shutdown when power gets low enough... gives user 60 seconds to cancel if they need more time to finish up. Fun is fun, but who really needs crashes and file corruption, anyway? This release brings some changes to how a user can interact with the system. Previously, a user had nearly zero access to any administrative tasks on Absolute. 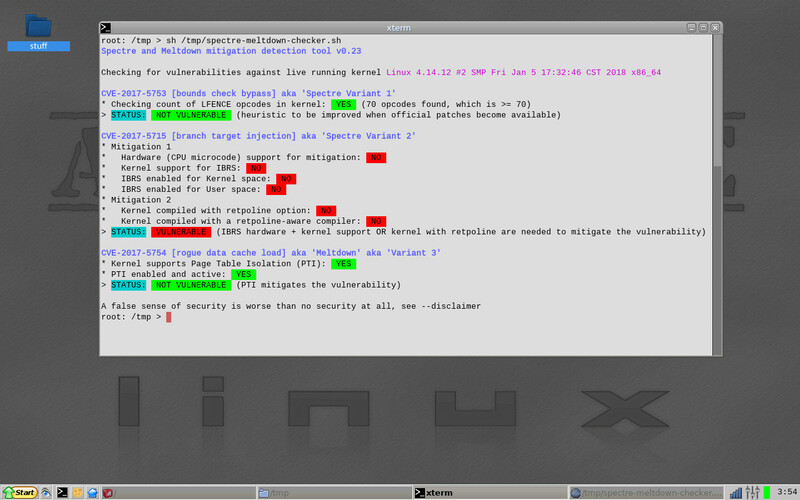 Now sudo is being used (usually through a YAD gui dialog) to perform many unreachable functions. To do so, however, sudo has been configured to require the root password. Several tweaks to keep things working well after large update to 10.0. Coincides with the Slackware 14.0 release, keeping in step with libraries, toolchain and basic apps. Absolute has moved away from udisks to use the lighter spacefm file manager, which takes advantage of native kernel polling. So as always, Absolute will run fast on modest hardware. Network manager is taking care of internet connections by default. Java and multimedia add-ons need to be installed (via system tools, as root) post-installation. Chrome browser is now the default (taking the place of chromium and/or firefox.) I distribute the browser with several plugins and the Chrome browser comes with a more up-to-date flash release than what is available as a generic plugin for Linux machines. If you install the firefox browser (from Extra/internet) you might want the flash plugin package located there as well. Last note about the browser -- I had briefly switched to Firefox as the Absolute default, but a couple "hang-ups" made me switch back to the Google app. Sorry about any confusion. I just like to use whatever works best. So many kernel/lib/codec changes since last summer we really needed a new, clean release to make installation easy again. New kernel and new perl (and all 25 related per modules... still have to update those on CD2.) Fixed unmounting problem for users and eliminated the stale mountpoints left in /media for USB sticks, etc. Worked the kinks out of new pcmanfm and finished customising to taste... All libs and other packages are up-to-date with slackware 13.37 release for compatibility. Use of HAL has been dropped for newer consolekit/udisks as well as lxde's newer version of pcmanfm. Code changes for the Absolute customizations in libfm and pcmanfm are included in /usr/doc for each package. Devmon replaces halevt to handle DVD and audio CDs. You'll notice edits to .initrc, .bashrc .bash_logout as well as the startup file for icewm reflecting the changes. Security updates and interface tweaks. Barring any last-minute bug fixing this should be the 13.1.x final. Security updates including mozilla-nss package, (and Firefox, Seamonkey and Thunderbird on CD2.) Icewm menu fixes and re-arrangement and AbiWord is back in base install with gtk printing preview by epdfview (so no more abiWords crashes... right?) Also several package updates including OpenOffice, Imagemagick, Inkscape, Chromium Browser, and new default sound mixer - alsamixer-qt4. New script in menu to change screen locker mode and updated find-installed script. Security update main cause for version bump. A few new applications, lots of library package updates and a wee bit of interface tweaking. Starting to feel like a 13.1.x final. Multimedia Installer corrected. Want a release not to need a download to correct... also Chrome browser updated (v6.0.482.0, again compiled on Absolute with gecko-mediaplayer plugin enabled) and with 2 plugins pre-packaged (PDF reader and extensions buttton.) Also a slew of updates originating from the Slackware repo. Chromium browser updated, distributed with PDF viewer extension pre-configured, so PDF viewing is a non-issue. Also a security fix, several programs updated for new icewm menu insertion procedure, geeqie updated to allow multiple instances, GIMP updated as well as several apps in CD2 directory in repositories. AbsChart (pie chart maker) back in Graphics menu . New kernel, and a boatload of updates from Slackware. ALMOST replaced Firefox with Google-Chrome (which I am really liking...) but due to endless "upl;oad" bug , that keeps crashing Chrome when you try to upload a file, it'll be in the CD2 directory for testing/playing. Should be 14.0 due to new kernel, new Xorg, new GCC, new GTK... but we follow Slackware versioning for compatability. Kernel is 2.6.33, Xorg is 1.7.5. Deps for this along wioth additional user-submitted theme included. Just got tired of problematic CD burning, deciding, finally, that enough was enough. We'll use something that works. Only a few packages changed, but the multimedia installer was not properly updated and this could lead to some confusion and lack of functionality for users who chose to install the media enhancements. Lots of updates to sync with Slackware-current and some multimedia scripts updated to keep pace with new kernel device nomeclature. Turned out a lot less painful than expected... Brasero (CD Burning) is back. DVDStyler added. Aside from kernel a lot of multimedia capabilities were updated and tweaked. Also removed Brasero (CD Burning) as it is too dependent upon Gnome and switched to simpler xfburn. Has a few xfce-related dependencies but these are small and also allow easier development for users if they want to use the libraries. You may also notice that wxGTK libraries are in the base install, used by the the chm help viewer and also support Audacity, now compiled and sitting on CD2 in the multimedia folder. Several security updates, updated libs and beginnnings of internationalizing the custom scripts and apps that are part of Absolute (thanks to GALPon MiniNo Developers Team.) In addition a new utility to change language/keymap from a GUI utility. Avidemux now in base install, epdfview replaces xpdf, AbiWord now comes with collaboration plugin with proper support to create online accounts. and some additional interface scripting/tweaking. This is the nice, peaceful, usabillity-improving portion of development. Really very pleasant. Good time for other developers to hop in? Brasero has replaced K3B and kdelibs, kdemultimedia and arts have all been removed. Gtk themes have been implimented and are changeable via customized gtk-chtheme utility. While we are staying away from the heavy integrated environments, we can still get our lightweight apps to look good and coordinate with each other... changing Gtk theme also changes icewm theme, desktop background (in pcmanfm) and window background for ROX-Filer. So far there are themes of clearlooks, warm, gray and black. Any contribs most welcome. For background info, check out the /usr/local/bin/settheme script. It is called from gtk-chtheme and the script lets you know exactly what files are being used. Kernel tweaked, bugs squashed, interface oiled. ...despite what memory usage some folks may mention, the old Dell on the right at 128mb of RAM is quite capable, even with shared video memory, of running apps as memory-hungry as Firefox without disk-thrashing. While the speed of such hardware might not be acceptable to some, if all you have available for a machine is comparable to the Dell, you will most certainly be able to run Absolute Linux, take advantage of all the latest, greatest software and not have to worry about lockups or stability issues. I ALWAYS test on older machine(s) -- that's a big part of what Absolute is about . . .
New xorg server and several updated X module packages, updated SVG handling preference in firefox-3.5.2 (due to lockups in default 3.5.2 release), a few other updated libs. UI tweaks, persistent text clipboard daemon (very lightweight), new keyboard keymap setting utility, Geany is now default text editor (replacing Nedit) both due to increased utility and fact that the app is UTF-8 aware. Nedit still installed but will likely be phased out. Other package updates keep pace with Slackware. This should be the final release candidate, but no promises; fingers crossed for 13.0. Midori installed from main ISO, option to change to default in control panel. New KDE libs (in support of new K3B), a large number of interface tweaks, mostly to do with filetype handling. Seems pretty stable, looking for bug reports. Every single package has been at least re-packed, majority modified/updated. Interface updated along with kernel, python, packaging system which is now txz-based and due to higher compression the main release contains much more than previously: OpenOffice and Java, as well as many other applications now fit on a single CD. Pcmanfm and rox have both been modified to seamlessly work with the TXZ package archives as well as the new "Add/Remove Programs" item in root menu. New volume control (now in system tray, sleeker.) New theme, more complete file type handling. Updates to K3B, smplayer based upon this. Plus a large number of additions and updates. Several programs moved to CD2 or /extra. Monday, 03/23/2009: new (and slightly) improved. This release brings kernel-2.6.28.8, (seeing how Slackware updated their kernel the day after our last release. Bad luck, there.) Only a few other changes. New freetype and cairo working fine, when I first updated I must have ended up with a corrupt download or a bad burn on a disc -- because I had trouble at first but smooth sailing since. Updated GIMP (with all the extra scripts and brushes), updated netconfig to automatically restart inet1. Updated WordNet dictionary to version 3.0 (changing run script so no environmental variable needs to be set.) Added SciTE editor and Secret maryo Chronicals game to CD2. Wednesday, 03/18/2009: Grab it from the downloads page. This release brings kernel-2.6.28.7, autoinstall defaults to ext4 filesystem. (Regular install allows for ext3 and reiserfs as well.) The kernel, for now, is the Slackware hugesmp, so it is Slackware "stock" Waiting feedback if users like this or would rather get specific cofiguration tweaked. The large number of changes along with imminent bump in Xorg led me to go with the flow for now in order to expidite and allow easier input from Slack-compatible repositories. In addition to the new kernel there was a very large number of application as well as library updates -- so installing via update/gslapt is not advised. Only real interface tweaks were making sure ROX-Filer did not run pinboard even when set not to (this saved us a bit of memory usage) and if you switch from netcofig or manual network setup to wicd usage the rc.inet1.conf automatically gets reset at boot -- so you won't get confused or have to tweak your configuration. Thursday, 01/08/2009: Grab it from the downloads page. Tuesday, 12/09/2008: switched from being parked on personal homepage to this site. Friday, 11/14/2008: Many, many thanks go out to Darren Austin of slackware.org.uk for providing us with the package repository. this has enable a sane release schedule as well as the ability to set up gslapt/slapt-get within the distribution to facilitate updating in a simple and reasonable fashion.